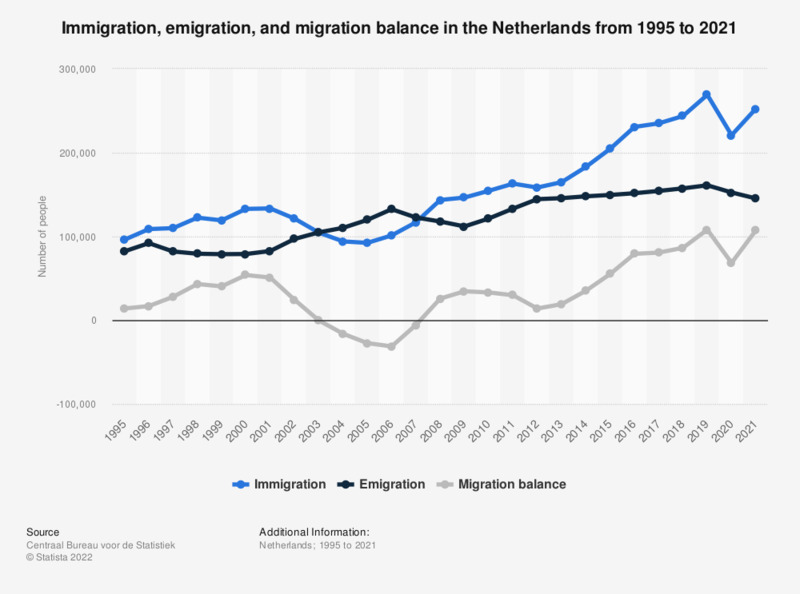 This statistic shows the total immigration, total emigration and the migration balance in the Netherlands from 2007 to 2017. It shows that in 2017, approximately 235,000 people immigrated to the Netherlands. Emigration including administrative corrections. The total of the administrative corrections is the sum of the administrative inclusions minus the administrative removals. Administrative inclusion means that a person is included in the municipality administration at his/her own request. This is not the result of a birth, immigration or relocation to another municipality, and is usually the case with people who have been administratively removed even though they had never left the country. Administrative removal means that persons are removed from the municipality bookkeeping because the municipality cannot reach the person, has no information regarding his/her whereabouts and this person is no longer living in this municipality. This is usually the case with people leaving the country without informing the municipality. From 2010 onwards emigration numbers increased slightly because of a change in the production process. Do you agree that that the number of immigrants in Italy should be reduced?